For the Nintendo DS game, see Pro Yakyuu Team o Tsukurou! 2 (Nintendo DS). Pro Yakyuu Team o Tsukurou! 2 (プロ野球チームをつくろう! 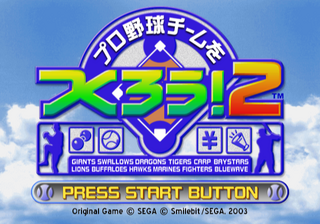 2) is an entry in Sega's Let's Make series for the PlayStation 2 and a sequel to Pro Yakyuu Team o Tsukurou!. Main article: Pro Yakyuu Team o Tsukurou! 2/Magazine articles.